“With the government’s support and assistance, all of the issues have been officially submitted to the government for their consideration at the next government meeting and the Chamber has received an official and satisfactory reply,” Mr Sisavath said. Mr Somsavat said the main issues had been resolved including improvements to legal documents for insurance, inventory rights, illegal trade, transport, tourism development, mining exploration and concessions, trade along borders/boundaries, the import of labour for the agricultural sector, land concessions for commercial plantations, reduction in waiting time for business certificate applications, skilled labour, and the establishment of special economic zones for export. “From the 7th forum, the private sector working group and business associations have examined their operations and have coordinated with state sectors and helped them to find suitable solutions for those issues that the private sector proposed to the government at the previous forum,” Mr Somsavat said. 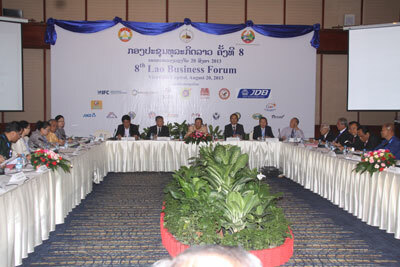 The 8th forum opened the door for the state and private sectors to discuss, study and find solutions to problems that delay business operations at present. progress. Deputy Minister of Planning and Investment, Dr Khamlien Pholsena, said the 8th forum had discussed the problems of labour and skilled labour development issues, an amendment to the Prime Ministerial Decree on the leasing law, implementation of court verdicts and the appellate process, a policy on promotion and facilitation of the agriculture sector, and a policy on the promotion of and raw material supply to the handicraft sector. It also debated the management and development of tourist transport services, preservation of eco-tourism sites, the tourism promotion board, high domestic and international transport costs, the high cost and time consuming process for checking goods transport documents at border checkpoints, the cost of electricity and the construction of hydropower dams, issues related to the construction business and other issues within the mining sector. ??????????????????????? ??? ????????? ?????????????????????????????? ?????? 8 ??????? 20 ????? 2013 ???????? ?????????? ???????????????????????????????????????? ??? ?????????????????????? ?, ?????-????? ?, ??????????????? ??????????????????????? ??? ??????????????????????????????? ????????? ????????????????????????????????????????????? ??????????? ??? ???????????????????? ??????????????????????????????????. ?????? ?????????????????????????????????????? ???????????????????????????-?????? ?????? ???????????????????? ??? ????????? ?????????????????????? ??? ???? ????? ??????????????????????? ??? ??????????????????????. ???????????????? ????????????????????????????? ????????? ??????????? ????????????????? ?, ????????????????????? ?, ????? ????????????????? ?, ????????? ?, ????????????? ?, ????????????????????????????????? ?, ???? ?, ????????????????????? ??? ???????? ?, ??????????????? ??? ??????? ???????????????????? ?, ?????????????????????? ??????????????????????????????? : ???????? ???? ???. ??? ???????????? ???????????????????????????? ??????? ?????? ??? ?????????? ???????????????????????? ?????????????????????? ??? ?????????? ????????????????????? ???????? ??? ??? ????????????????? ??? ???????????????????????? ????????????????????????????????? ?, ?????????????????????? ???? ???????????????????????. ????????? ???.??? ??? ???????????????????????????????????????????? ??? ???????????????????????????? ????????????????????????????????? ???? 2015 ????????????? ?, ???????? ??????????????????????????? ????????????????????????????????????????????????????????????? ????????????????????????????? ??? ????????????????? ???????????????????????????????? ??? ???????????? ??????? ???????????? ?????????????????????????????-?????? ????????????????????? ?, ???????????? ??? ??????????????????? ??????????? ?, ?????????????????????????????????? ??? ????? ??????????. ????????????????????????? ????????????????????????????????????????? ?, ???????????????????????????????????????????? ???????? ??????????????????????????????????????????????? ????????????????? ?, ?????? ?, ?????????????????? ?, ???????? ?????????? ?, ???????????????? ?, ????????????-?????? ?, ????????????????? ?, ??????????????????? ??? ???? ?.